It's that time again! Here are ten of Something Greek's favorite celebrities in fraternities and sororities! 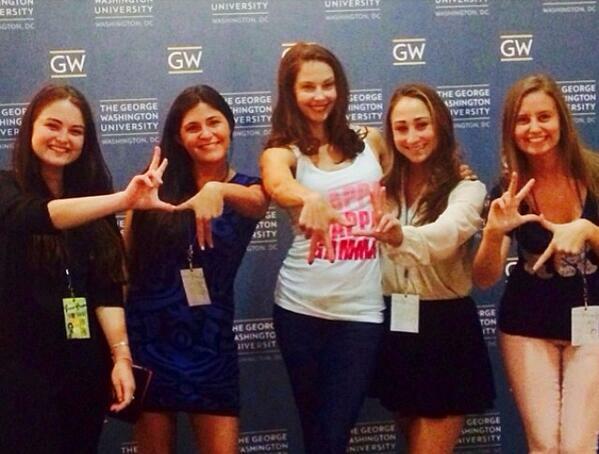 We usually have a hard time finding celebs in their letters, but we were able to get our hands on this picture of Ashley Judd in a Kappa Kappa Gamma tank! According to the Washington Post, the actress recently grabbed a bite to eat with some active sisters! Actor, director, screenwriter, and director Warren Beatty is a member of Sigma Chi. Judging by his current resume, we bet he held a ton of positions as an active brother. Whoever started the idea that you can't be smart and beautiful clearly never met Delta Gamma sister, Anne Coulter. For some reason, we don't have too difficult of a time picturing actor, Zach Braff, in a Phi Kappa Psi t-shirt. If we had been in Chi Omega at Indiana University with Catt Sadler, we'd have nominated her for social chair every semester. Modern Family star, Ty Burrell, is a brother of Sigma Chi. Mary Tyler Moore Show and Young Frankenstein star, Cloris Leachman is a sister of Gamma Phi Beta. James Marsden is a member of Delta Tau Delta. The beautiful Michelle Pfeiffer is a member of Alpha Delta Pi. Kevin Costner is a brother of one of my personal favorite fraternities (also the only one on this list that we had at my school), Delta Chi. We hope you enjoyed this installment of Famous Greeks! Check back next month for more famous fraternity brothers and sorority sisters.